Home Features What If We All Made the Same Kind of Difference? What If We All Made the Same Kind of Difference? Ron Hall didn’t plan to write a book. In fact, his formerly homeless friend Denver Moore pushed him into doing it together. In the beginning, no one wanted to publish it—38 submissions and 38 no’s from publishers later, they had to publish it on their own. Who would’ve known their book “Same Kind of Different as Me” would sit on the New York Times bestseller list for three straight years? What single thing could take this story and spread it to so many people and change so many hearts? Only the latent power of kindness, and the lives it changes forever. Ron’s life’s work was really about art; maybe this is why God decided to paint such a story with his life. He sold paintings worth millions of dollars. He was living the good life. So good, and yet he walked down a path that almost destroyed his marriage. Against all odds, his wife Debbie forgave him, and God slowly restored their broken marriage. All this led them down a path to the story he wrote. He owed his wife. Big time. One night, God gave Debbie a dream of a “poor, wise man who would change their city.” It was more than an ordinary dream. It unsettled her and she couldn’t get it out of her mind. She even saw the man’s face in her dream. The next day, they drove around their city to search for this man from the dream, Ron was in tow, and after hours of driving they stopped at a gospel rescue mission. Everything around the building was run down. No one cared much for this area of town, or the people that hunkered down here. So many without a place, or people, to call home. Reluctantly serving these people alongside his eager wife at the mission led them to what happened next. A man burst in kicking and screaming. Ron cowered behind the food counter. Yet as the angry man walked out Debbie cried out, “That’s him! That’s the man from my dream! Ron, you have to talk to him. That’s the man from my dream!” Ron would have preferred to never see the man again. Slowly, after months of effort and Debbie’s fiery persistence, Ron was able to talk with the man from Debbie’s dream. His real name was Denver he said. No one had known his real name in many years. Such was the life on the streets, life in the shadows. Their unlikely friendship grew and grew, and eventually Ron and Denver would call each other their “very best friend in the world.” Ron had given many a check to help the poor, but this was different. This time he gave himself in friendship. That was something more valuable than gold. Denver found in Ron and Debbie people who truly cared for him in way he hadn’t experienced in his whole life. Eventually Denver did get off the streets, and carried on Debbie’s passion to help those in need. Slowly, but surely, just as his own life was transformed by the power of kindness, he in turn played a key role in transforming his city, and providing hope for many on the streets. He convinced Ron to write their story down, which is why you are reading this today. The story of a life transformed by kindness is not as uncommon as you might think. Ask any of the rescue missions around the country and you’ll learn people do find hope, and their stories can change. It all begins with kindness, friendship and an uncommon passion to care. Ron and Denver have since done a fair share of speaking, sharing their story of hope and unlikely friendship. Together, they’ve helped raise over 100 million dollars to help those in need in cities across the country. In one city, pastors and leaders came together with a special excitement to change their city, working hard to put together a 10-year plan to eradicate homelessness from their city. After hearing some of their plan, Denver raised his hand to ask a question. They were delighted to get his insight. “How many homeless people are in your city?” he asked. On a micro level this city represented a macro-truth. Across our entire nation, there are about 1-2 homeless people for every one church. Can we really change the world? Isn’t it just too difficult to change such a broken life? Not if we all do our part. What if we all made the same kind of difference together? What if Ron and Denver’s story is meant to intersect with our stories now, for such a time as this? What if the church could be the church, and work together in unity and love at such a time of need in our world—and love the forgotten people, the people living in the shadows (and “the shadow of death”) with a fiery love that could only be given from heaven? 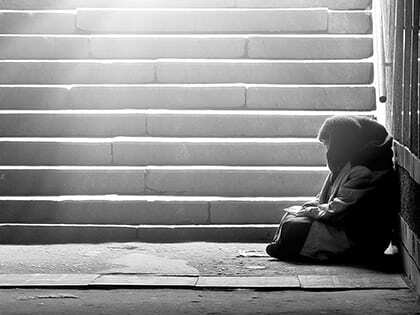 What if every church in America adopted one homeless person in their city? There are enough of us to touch them all immediately. There are many factors involved in homelessness, and maybe our commitment doesn’t mean we literally bring them off the streets. It was many years before Denver moved from the streets to a home. But what these people need most is more than a handout. They need someone to see them, to know their name, to show them uncommon care and love. So here is a plan. We can call it the “Denver Plan” from the man who knows. A poor, wise man who changed his city, and whose wisdom can help us change ours. Let’s all of us—every church—look for a way to each adopt one homeless person in our community. Each one person matters to God, and each one person should matter to us. We may not be able to change the whole world, but we can change one person’s whole world, and together we can collectively change a lot of people’s worlds. Here are four practical ways we can start changing the life of one. 1. Bring a group from your church to serve at your local rescue mission or shelter. Let’s make sure the forgotten people are forgotten no more, and that someone wants to know their name and their story. Remember, there are about 1-2 homeless people for every one church in America. Your church may not be able to do everything, but you can help one! Share a meal with one person, hear their story and simply listen. Simply listening could change a life forever. Begin to look for ways to stay in touch with one person, and provide in small ways for their practical, social, emotional and spiritual needs. You may not know where to start, so just take it an interaction at a time. As your friendship with one person develops over weeks, months or years, work with the local shelter or rescue mission to help in any way you can as a local church or group, to help get shelter and a job if the one you are loving and serving is capable to move forward. 3. Get a group from your church together to watch Ron and Denver’s story. “Same Kind of Different As Me” is available for streaming on February 6th and on Blu-Ray and DVD on February 20th. I believe it is perfect timing, a movie for “such a time as this” in our nation that is so divided. Plus, it will energize, mobilize and move you to tears what God can do when we reach outside our comfort zone’s to the life of someone in great need. You can also access, free materials for a 4-week church-wide campaign. 4. Look for simple ways to show kindness, and make a difference. After watching Ron and Denver’s story, look for other ways to do a “simple act of kindness” to other people in your city, whether they are homeless or not, and share your stories using #SameKindMovie. We never know how far we can all go until we step out and touch the life of another. 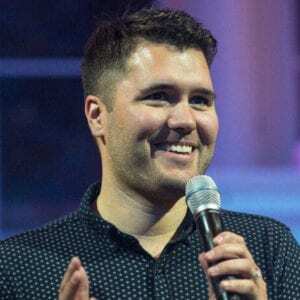 Matt Brown (@evangelistmatt) is an evangelist, author and founder of Think Eternity, an evangelistic ministry that reaches thousands of people with the gospel each year through live events and online. This article was originally published on Matt’s blog at ThinkE.org. Matt Brown is the founder of Think Eternity (ThinkE.org), an organization that reaches thousands of people with the gospel each year through live events and online resources. He is the author or co-author of several books, including most recently Truth Plus Love: The Jesus Way to Influence.